Mango lovers can get quality produce at their doorstep as farmers reach out to customers through online retail. A mango seller on the street. A second-generation alphonso farmer, Nandan Vishnu Gawde has mango trees that are now over 85 years old. His farm in Vengurla in Sindhudurg, which once bore close to 1,000 dozen alphonso mangoes, does not produce that much fruit anymore. As a result, he doesn’t get a fair rate for his mangoes from the brokers, who prefer to deal with big farmers in tonnes. In search of a way out, Gawde this year launched the website mangoomango.com, a platform he uses to retail mangoes. “Vengurla has not been marketed the way Ratnagiri and Devgad have, but the produce from here is on par. Besides, mine is an organic farm. I’m sure customers will taste the difference in quality between what’s sold in the market and my product,” says the 50-year-old farmer. Online and direct retail models are being viewed by several small mango farmers as means to make a fair buck on their quality produce. The investment is minimum and it also helps them develop themselves into a brand, earning them repeat customers. It’s beneficial for the customer too, who pays less than the market price, given that the broker is out of the equation. Also, since the minimum order is a dozen, customers don’t need to make bulk purchases to avail the discounted price. Devgad Taluka Mango Growers Co-operative Society, a 27-year-old organisation with 700 small mango farmers from the Devgad region as members, adopted the online model in 2011. 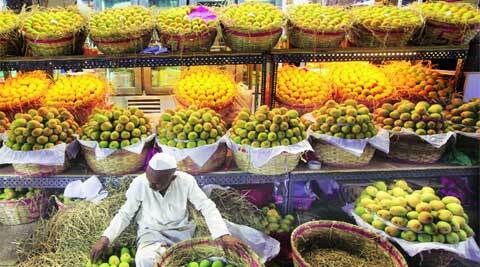 Last year, they sold 2,500 dozen mangoes of the famed Devgad variety. “The cooperative was formed to work in the interest of small farmers by bringing all the members under one umbrella to command a fair price from brokers. But over the years, we realised that no matter how good our produce, the brokers and sellers mix it with mangoes of average or poor quality to mark up their profits. Our export-quality mangoes are also wasted when foreign countries reject consignments if they don’t meet their packaging norms. At other times, the consignments are stuck at customs, causing the fruit to decay,” says Omkar Sapre, a board member of the cooperative who sees online retailing as the solution to these problems. The cooperative society’s website, devgadmango.com, not only accepts orders but also educates customers on the different export-grade mangoes they offer. After noticing their success, a similar initiative was launched by a cooperative in Ratnagiri under ratnagirimango.com. AAR Mangoes from Nate near Jaitapur doesn’t follow the online model but directs customers to their on-ground dealers — who exclusively sell their product — in key cities in Maharashtra such as Mumbai, Pune and Nashik. But the model isn’t glitch-free. Problems arise when farmers have to go beyond their production chain and rely on courier services to deliver the product. Sapre and Gawde complain that delays or manhandling on part of the courier service results in decay of the fruit, causing them losses of cash and, sometimes, also customers. “We replace a bad consignment and our website clearly explains the procedure on the front page. But sometimes, people don’t pay attention to these details and quit disgruntled,” says Sapre. Gawde adds that the entry of bigger players such as The Bombay Store and greenkart.in — and several portals by brokers have popped up in the last few years such as shreemango.com and yummymangoes.in — has added to the competition. Also, people’s preference for cash-on-delivery adds to the risk. The short shelf life of the fruit also makes it difficult for the farmers to reach out to customers in states beyond Maharashtra. Most of these services can retail only to parts of Karnataka, Gujarat and other neighbouring states. The Devgad cooperative, however, is now also reaching out to Delhi, Chennai and Kolkata.